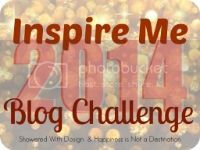 Welcome to Day 9 of Inspire Me 2014! I was struggling with this at first because I'm still a newer blogger myself and don't know all the ins and outs yet. But then it came to me. I've given advice on a variety of issues other bloggers have had but there's one thing in particular that I seem to explain the most: when someone leaves a comment and then they are a "noreply-blogger." For those who don't know what that means, it's basically saying that I can't respond to you unless I reply directly on the blog. Sometimes that's ok to do, but many bloggers prefer to respond via email, such as myself, and it can get a little frustrating because we want to reply but can't. It's also hard because if we have to reply directly through our blogs, you may not even think to look. When I first started blogging and didn't know about this, I'd comment on someone's post and then get a little sad when I never got a reply. I'd have to go dig around to find the post and then see the comment. 1) Go to your Blogger Dashboard. Up at the top right you'll see your name with an arrow.